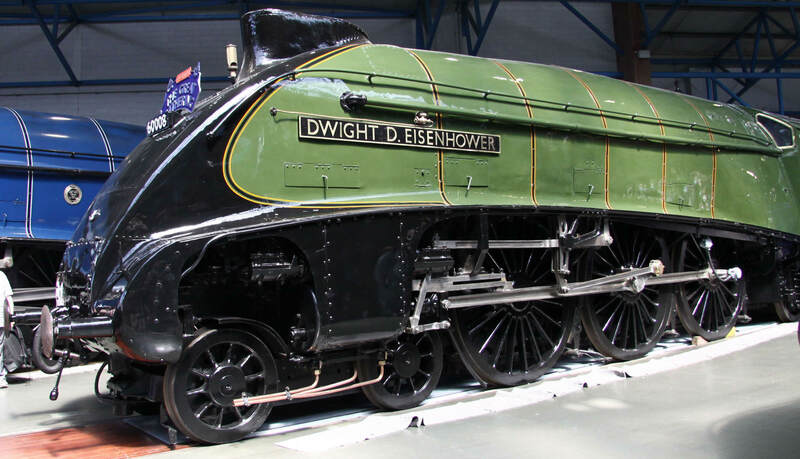 When last we saw the six surviving A4 Class Pacific steam locomotives, the two that live abroad — Dominion of Canada from the Canadian Railway Museum in Montreal and Dwight D. Eisenhower from the National Railroad Museum in Green Bay, Wisconsin — had just arrived in Liverpool, England. 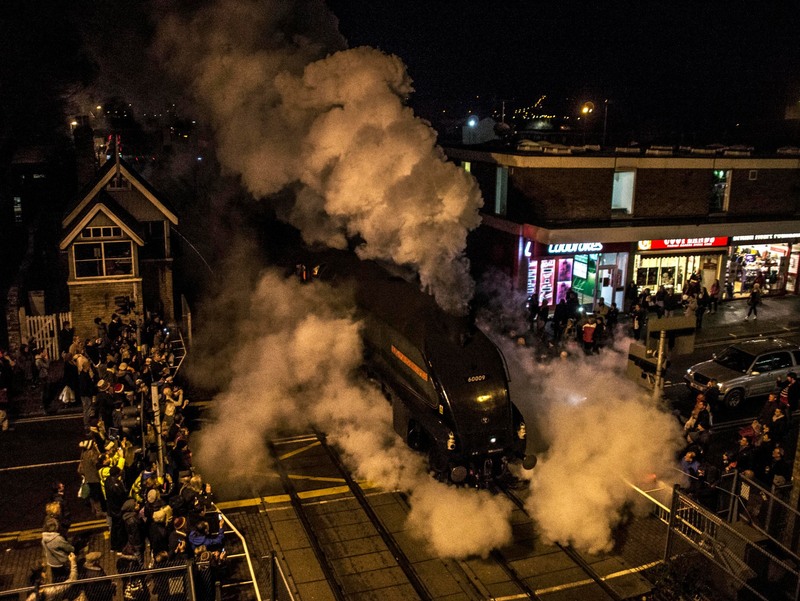 This massive effort was undergone so that all six of the A4s could come together to celebrate the 75th anniversary of the day one of them, Mallard, broke the world land speed record for steam locomotives by hitting 125.88 miles per hour during a run between Little Bytham and Essendine in Lincolnshire. Mallard set that record on July 3rd, 1938, and it still stands to this day. The noble A4s couldn’t hold out against the advent of diesel engines and were gradually taken out of service in the 1960s. By the time they were finished being used for parts and decaying unused in depots, only six of the original 35 were still intact. Two were sent to North America and the others wound up in museums in the UK. 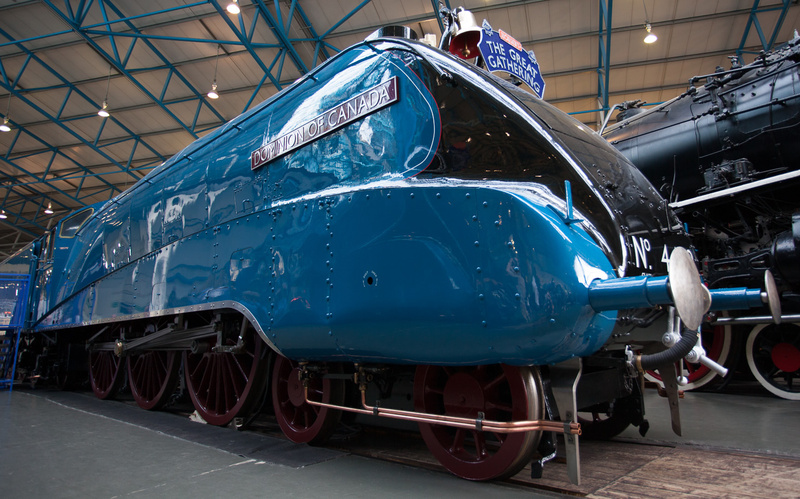 The record-breaking Mallard has been on permanent display at the National Railway Museum in York since the 1980s. While all of that was going on, the National Railway Museum found itself fighting for its life. Cuts in government grants left its parent organization with large projected deficits that put the museum in danger of closure. The York Press launched a campaign to save the NRM which was strongly supported by train lovers and the people of York. It worked, and the looming threat of closure was extinguished just in time for the anniversary celebrations. On July 3rd, the Great Gathering opened to the public. It was an instant smash hit, so much so that the museum had to institute a “one in one out” policy in the mornings due to massive lines. People flocked to see the six A4s with their sleek lines and handsome curved noses and they’re still flocking now. 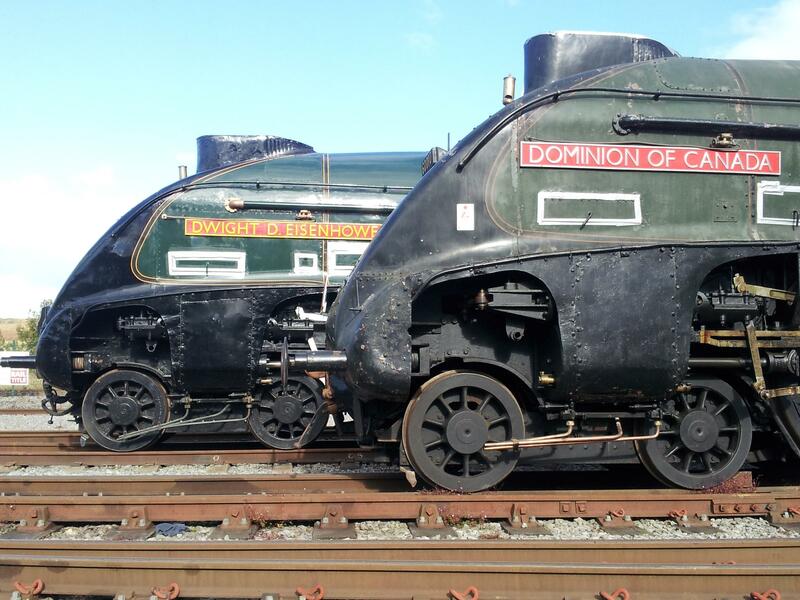 The last day of the Great Gathering is July 17th, but there will be two more opportunities to view all six locomotives together: the Autumn Great Gathering at the museum in York from October 26th to November 8th, 2013, and the Great Goodbye in Shildon from February 15th to February 23rd, 2014. There are lots of wonderful pictures of the trains and crowds of train fans enjoying this singular exhibition on Flickr. The National Railway Museum’s Facebook page has a variety of lovely and interesting views of the trains in action and on display. Many of them were taken by members of the public watching the trains go by. My favorite is this phenomenal shot of Union of South Africa departing the station at Lincoln. This is why nothing can replace the steam engine in the crucial moments of mysteries, romances and films noir. This entry was posted on Sunday, July 14th, 2013 at 11:42 PM	and is filed under Modern(ish), Museums. You can follow any responses to this entry through the RSS 2.0 feed. You can skip to the end and leave a response. Pinging is currently not allowed. Steam locomotives come with their own built-in fog machines to make them look more dramatic! I wish I came with my own fog machine. I’d make entrances like you wouldn’t believe. Visited York on Sat. 6th July (72ndbirthday) but also as an ex railway employee. Sadly there were no photographs available of the occasion to buy (without spectators) Is it possible to sell me a copy of your above photograph (A5 size). Have to say the visit brought back many happy memories. Is that all you need to say!!! We were lucky enough to have ‘The Great Goodbye’ just down the road from us here in Shildon – a great bit of nostalgia.